I don’t think there is a mechanical engineer out there who doesn’t have a soft spot for gears. There’s just something about spinning bits of metal (or some other material) meshing together that is mesmerizing to watch, while opening up so many possibilities functionally. Particularly mesmerizing are planetary gears, where the gears not only spin, but orbit around a central axis as well. In this article we’re going to look at the particulars of planetary gears with an eye towards investigating a particular family of planetary gear setups sometimes known as a ‘differential planetary’ set. Planetary gears normally consist of three parts; A single sun gear at the center, an internal (ring) gear around the outside, and some number of planets that go in between. Generally the planets are the same size, at a common center distance from the center of the planetary gear, and held by a planetary carrier. In your basic setup, your ring gear will have teeth equal to the number of the teeth in the sun gear, plus two planets (though there may be advantages to modifying this slightly), simply because a line straight across the center from one end of the ring gear to the other will span the sun gear at the center, and room for a planet on either end. The planets will typically be spaced at regular intervals around the sun. To accomplish this, the total number of teeth in the ring gear and sun gear combined divided by the number of planets has to equal a whole number. Of course, the planets have to be spaced far enough from each other so that they do not interfere. Fig.2: Equal and opposite forces around the sun equal no side force on the shaft and bearing at the centre, The same can be shown to apply to the planets, ring gear and planet carrier. This arrangement affords several advantages over other possible arrangements, including compactness, the possibility for the sun, ring gear, and planetary carrier to use a common central shaft, high ‘torque density’ due to the load being shared by multiple planets, and tangential forces between the gears being cancelled out at the center of the gears due to equal and opposite forces distributed among the meshes between the planets and other gears. 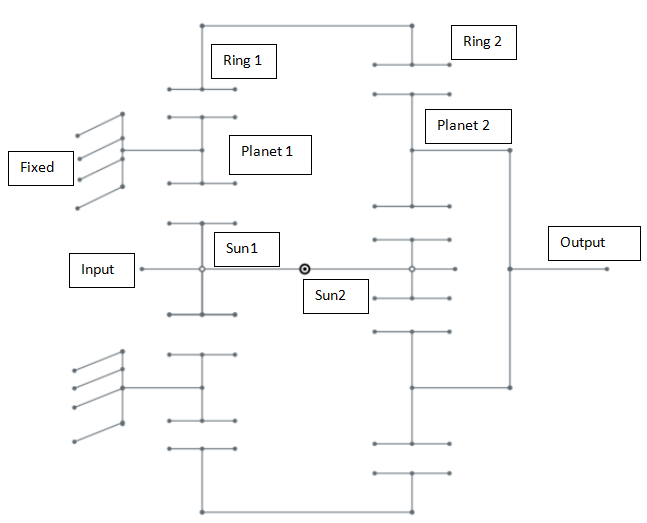 The sun gear, ring gear, and planetary carrier are normally used as input/outputs from the gear arrangement. In your standard planetary gearbox, one of the parts is held stationary, simplifying things, and giving you a single input and a single output. The ratio for any pair can be worked out individually. Fig.3: If the ring gear is held stationary, the velocity of the planet will be as shown. Where it meshes with the ring gear it will have 0 velocity. The velocity increases linerarly across the planet gear from 0 to that of the mesh with the sun gear. Therefore at the centre it will be moving at half the speed at the mesh. 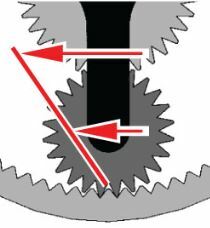 For example, if the carrier is held stationary, the gears essentially form a standard, non-planetary, gear arrangement. The planets will spin in the opposite direction from the sun at a relative speed inversely proportional to the ratio of diameters (e.g. if the sun has twice the diameter of the planets, the sun will spin at half the speed that the planets do). Because an external gear meshed with an internal gear spin in the same direction, the ring gear will spin in the same direction of the planets, and again, with a speed inversely proportional to the ratio of diameters. The speed ratio of the sun gear relative to the ring thus equals -(Dsun/DPlanet)*(DPlanet/DRing), or simply -(Dsun/DRing). This is typically expressed as the inverse, called the gear ratio, which, in this case, is -(DRing/DSun). the center of the planets (half of the mesh speed) divided by the diameter of the carrier. The gear ratio would thus be DCarrier/(DSun/0.5) or simply 2*DCarrier/DSun. There is, however, a generalized method for figuring out the ratio of any planetary set without having to figure out how to interpret the physical reality of each case. 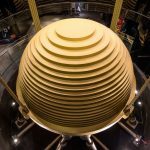 It is called ‘superposition’ and works on the principle that if you break a motion into different parts, and then piece them back together, the result will be the same as your original motion. 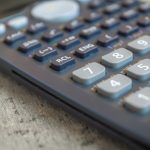 It is the same principle that vector addition works on, and it’s not a stretch to argue that what we are doing here is actually vector addition when you get right down to it. In this case, we’re going to break the motion of a planetary set into two parts. The first is if you freeze the rotation of all gears relative to each other and rotate the planetary carrier. Because all gears are locked together, everything will rotate at the speed of the carrier. The second motion is to lock the carrier, and rotate the gears. As noted above, this forms a more typical gear set, and gear ratios can be derived as functions of the various gear diameters. Because we are combining the motions of a) nothing except the cartridge carrier, and b) of everything except the cartridge carrier, we are covering all motion taking place in the system. The information is collected in a table, giving a speed value for each part, and the gear ratio when you use any part as the input, and any other part as the output can be derived by dividing the speed of the input by the output. 1: The planet carrier is held stationary, the sun is the input, and the ring gear is the output. Or just -DRing/DSun, which matches what we obtained earlier. 2: The ring gear is held stationary, the sun is the input, and the planetary carrier the output. So our gear ratio becomes x[1+1/(Dsun/DRing)]/x, or simply 1+(DRing/Dsun). The final step to get it in the same terms as before is to realize that the diameter of the carrier is equal to the diameter of a planet plus the sun (the diameter spans the sun, plus half a planet on either end), while the diameter of the ring is the diameter of two planets plus the sun (the diameter spans the sun and a full planet on either end). Which then becomes (Dcarrier-Dplanet+Dcarrier+Dplanet)/Dsun or 2*Dcarrier/Dsun, which is the term we derived earlier. The superposition technique allows far easier analysis of more complex planetary arrangements, and we will come back to it in a bit. Your typical multi-stage planetary gear arrangement is simply two or more standard planetary arrangements in series. For example, if you had fixed rings in all cases, your first sun was your input, and your first planetary carrier fed into a second sun, that drove a second planetary carrier as your output, your total gear ratio would be the reduction of your first stage times the reduction of your second. This would be (1+(DRing1/Dsun1)*(1+(DRing2/Dsun2). Let’s say you were aiming at the highest possible reduction, your largest acceptable ring gear had 100 teeth, and your smallest acceptable sun had 12 teeth, your largest two-stage reduction would be 87.1 to 1. But what if you weren’t simply to arrange your gears in series? 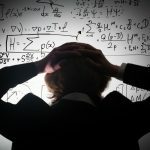 Realizing that your planetary set has three input/outputs, what if your first stage drives two inputs of your second, instead of fixing anything in the second stage? This arrangement yields a ‘differential planetary’ set, where the ouput from your second stage is a function of the differential between two inputs. This is sort of like the differential in your car, whereby the speed of each wheel is a function of the differential between the input from the driveshaft and the other wheel. One such arrangement is as shown. 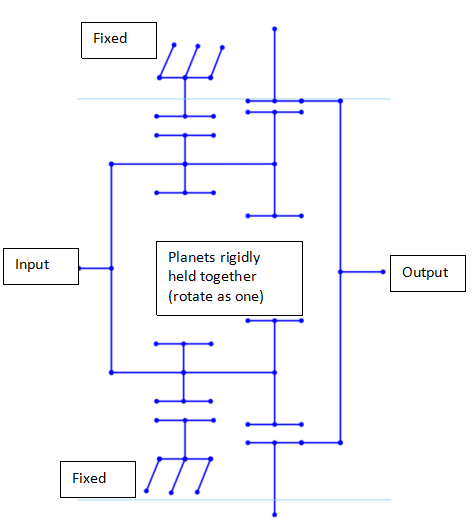 The planets in both stages are rigidly fixed together, the first ring is fixed, the common planet carrier is the input, and the second ring is the output. The closer (DPlanet2*DRing1) gets to (DRing2*DPlanet1), the higher your gear ratio will be (because the denominator tends to 0). If they are actually equal, the gear ratio will be indeterminate, and, practically, your output simply will not move at all, so we need some difference. Because all of the planets share a common center, for every tooth you add to a planet, the ring in that stage will increase 1/2 tooth per side, so the sizes of the planets and ring change at a 1:1 ratio, getting larger or smaller together. you come out with a 726 to 1 ratio. There are ways to play with the gear profile to get the number even higher. the gear ratio climbs even higher, to 891 to 1. 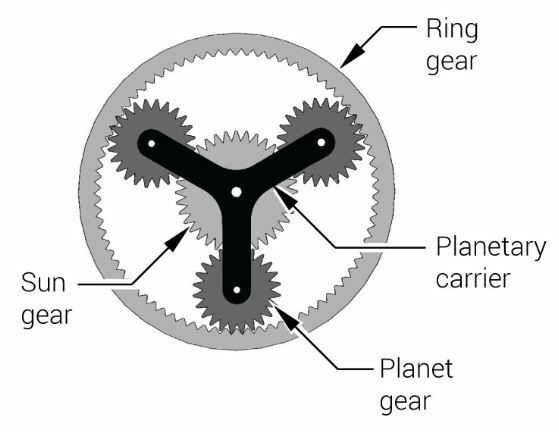 One way to think about why this gear arrangement works is to imagine the two sets of planets having the same number of teeth. Every time the planets move forward a tooth, the two sets of ring gears align at the meshing tooth. 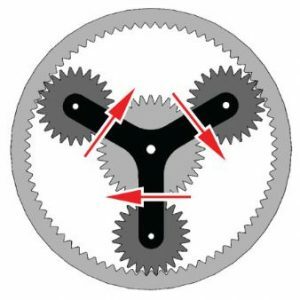 If the ring gears also had the same number of teeth, they would align at every tooth, and since one is fixed, the other would not move either. However since the fixed gear has one extra tooth, every time the planets make a full revolution around the fixed gear, the movable ring gear falls one tooth behind. To fall behind an entire revolution, and thus have the output move a single revolution, the planets would have to make a number of full revolutions around the ring gears equal to the number of teeth in the movable ring gear. If you are familiar with harmonic gears, they work in much the same way. This is almost the case, except that with the planets also being a tooth off, the number of teeth that the output falls behind the fixed gear is a bit different. In our first case, the 45 tooth gear turns approximately 2.22 times each time it goes around the 100 tooth ring gear, which turns the 44 tooth gear approximately 97.78 teeth. The 99 tooth output gear thus moves roughly 1.22 teeth (99 – 97.78) every time the planets make a full revolution. 99/1.22 = 81 plus a rounding error, which is the gear ratio we derived earlier. There are practical problems with this gear arrangement. One such problem is a low efficiency. In your typical spur or helical gear arrangement, you have some gears carrying low torque, but spinning quickly, and some gears carrying high torque, but moving slowly. This keeps energy losses relatively low. However, in this case, you have the planets meshing with the output gear, thus carrying high loads, while also moving quickly. If the input speed is 100 RPM, the output is only 1.2 RPM, but the planets are rotating at over 200 RPM, while meshed directly with the ouput. The combination of high sliding forces and a lot of motion results in a lot of energy wasted. There is another way to think about why this gear set works, however, and that is to think about the stages as two separate planetary arrangements. 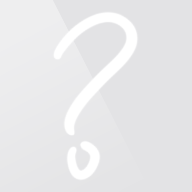 For any particular arrangement, if you set two of your input/outputs, the third will be determined. For example, in the arrangement above, with two sets of ring gears, and a carrier (the input) that carries two sets of planets, joined together, since you are fixing one ring gear, if the second set had gears of exactly the same size, with the same input (the carrier, in this case), the second ring gear would not move. This is because it would have the same relationship of the ring gear to the other gears as the first set, and since everything else is moving exactly the same way, the second ring gear would move the same way as the first – that is, not at all. If the two stages are nearly identical, but not quite, the second ring gear will be nearly stationary, which is what gives you the high gear ratio. If you think about it that way, it opens up the door to consider other gear arrangements, where you have two nearly identical stages, fix a component of one, and use the equivalent in the second stage as the output. Let’s consider one such arrangement, as the final example of this article. The suns of the two stages will spin together, and the two ring gears will spin together as well. 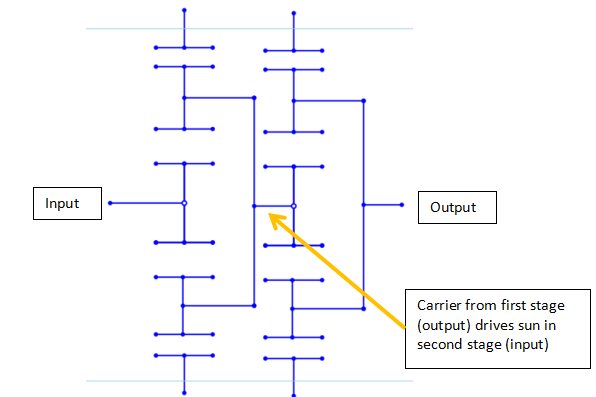 The carrier in the first stage is fixed, and the output is the carrier of the second stage. This gives us a number of equations to work with. Now, that may look like a bit of a mess, but if we just consider the denominator, the gear ratio will be highest when (Dsun2*Dring1) is as close as possible to (Dsun1*Dring2) without being exactly equal (which would mean that the carrier in stage 2 would move exactly as much as the carrier in stage 1 – that is, not at all). (Dsun2*Dring1)-(Dsun1*Dring2) = 2 (quite close to the lowest possible value of 1), and the gear ratio is an impressive 5841 to 1. There are a lot of ways you can put multi-stage planetary sets together, and this article only touches upon a few of them. Hopefully, it serves as a good introduction. I've just spent the last 6 months of my life designing a episcyclic gear train (A planetary arrangement).It was, frankly, a clusterf**k.It was inverted into an endocylclic mechanism, and that made things faster, but worse , in terms of what we initially intended to achieve.Gearboxes are difficult things to design – they can take years.Anyway, a very good article Steven.Perhaps you could also include a bit about the undesirability of relative primalities in gearing as a possible update? 'Relative primalities'? I'm guessing that I'm familiar with the idea using other nomenclature, but I'm not familiar with the term. A quick Google search didn't help either. Can you explain what you mean in other words?